Specifically designed plastic melt probes to provide true plastic melt temperature with millisecond response times. If you require the true plastic melt temperature, with millisecond response time and no conduction errors caused by the themowell; refer to these specifically designed plastic melt probes. For true temperature indication and control of the plastic melt, these units will deliver your requirements. Designed for use in extruder heads or die adapters of injection moulding machines, the sensor fitting is immersed 5mm into the plastic melt for optimum control. The high pressure thermowell sensor sheaths are manufactured from 321 stainless steel. 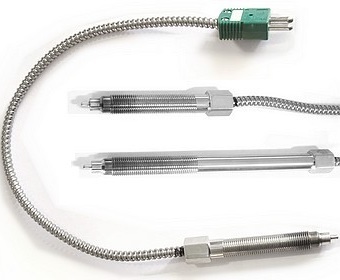 Standard units use type 'K' thermocouple junctions which are electrically grounded to the thermowell. 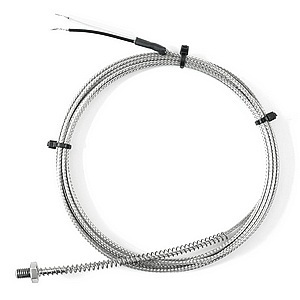 The unit has a flexable 14" (355mm) armoured extention cable connected to a standard 2 pin thermocouple plug. Type J Thermocouple Nozzle Pattern Sensor. Consisting of an M6x1.0, 5mm long, threaded bolt tip, with support spring and 3m of fibre glass insulated stainless steel over-braided extension lead. Designed for use in extruder heads or die adapters of injection moulding machines to measure plastic melt temperature, with millisecond response time.